No animal in the Zodiac is more sacred in China than the dragon. The dragon has long been a symbol of the region before the modern People’s Republic of China existed. People have viewed the dragon as a source of life, power, and good luck for thousands of years. It is no surprise that it appears in the 12-year cycle of the Zodiac. 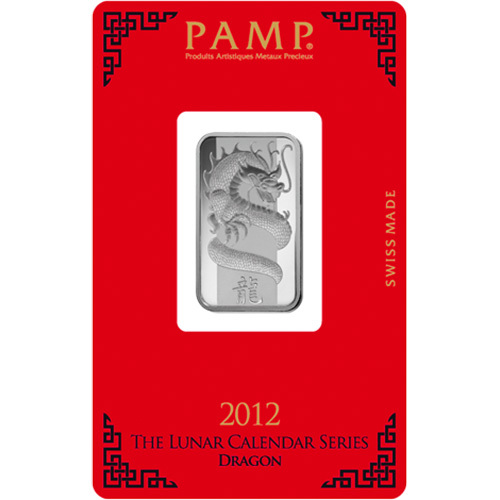 Today, 10 Gram Silver PAMP Suisse Lunar Dragon Bars are available to you online at Silver.com. Available to ship inside of protective plastic packaging with an included Assay card! Released for the Year of the Dragon in 2012! On the obverse of the bar is the image of a dragon curled around a pole. The reverse captures the same design from the reverse viewpoint. Features an individual serial number. Ideal for Precious Metals IRAs. The dragon was often used by ancient emperors are a symbol of their own military power and personal strength. In fact, the dragon is so intertwined with Chinese history that it is said the four great rivers of China were formed by ancient dragons who came down to Earth to form the rivers as a means of providing for humans. 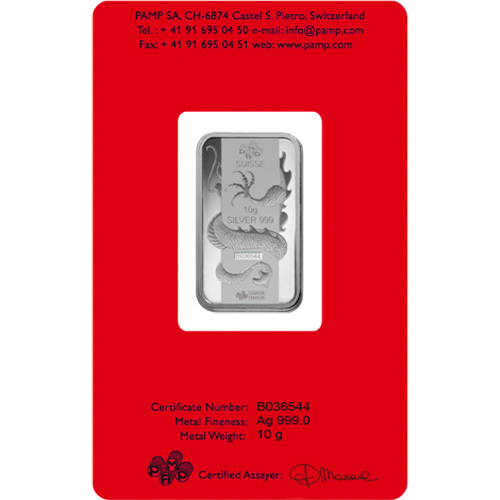 All 10 Gram Silver PAMP Suisse Lunar Dragon Bars are available to you inside of sealed protective packages that consist of a plastic housing for the bar and a red Assay card surrounding it. The Assay card has the signature of a certified assayer, the bar’s individual serial number, and the weight, purity, and metal content all printed on its surface. The dragon arrived fifth at the meeting at the Heavenly Gates called by the Jade Emperor. The dragon was known for its good looks and that immediately caught the eye of the emperor, who would name the dragon fifth in the Zodiac. 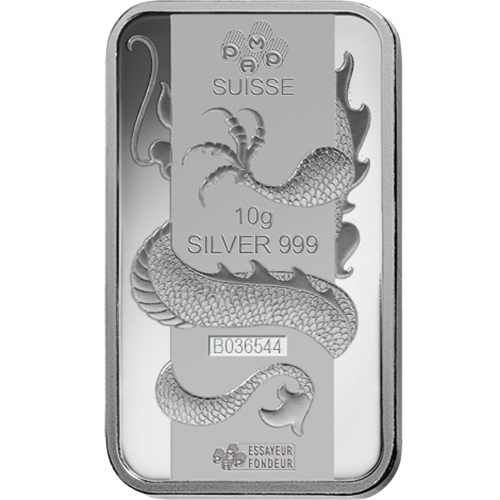 On the obverse of 10 Gram Silver PAMP Suisse Lunar Dragon Bars is the image of a serpent-like dragon climbing around a pole up toward the top. The design field includes the face of the dragon and one of its legs grabbing onto the pole. The Chinese symbol for a dragon is engraved on this side. 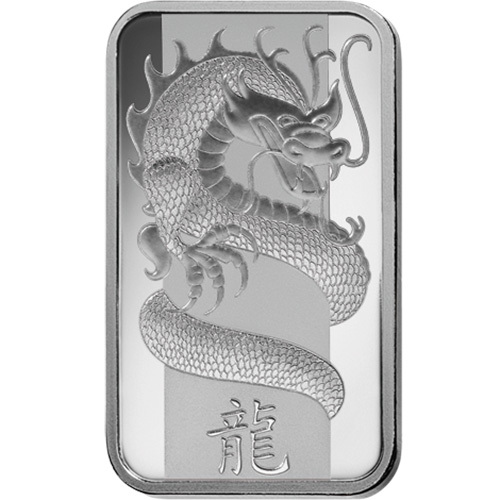 The reverse of 10 Gram Silver Lunar Dragon Bars includes the image of that same dragon, but this time you are looking at the design field from behind the pole. You can no longer see much of the dragon’s head from this viewpoint, but you can see the other leg it is using to keep a grip on the pole as it climbs. Please feel free to call Silver.com with your questions. You can reach us at 888-989-7223, chat with us live online, or email us directly with your inquiries. Live silver prices are also available on our site at all times!